The Lakers rolled past White Bear Lake to advance to the state qualifier game against familiar foe, Blaine. The Lakers took advantage of an interception by Michael Herbst and a short punt, scoring 14 early points as Prior Lake rolled to a 27-0 win over White Bear Lake Oct. 27 at Dan Patch Stadium in the first round of the Class 6A playoffs. After the Lakers (6-3) kicked off to start the game, the Bears (0-9) faced a third-and-8 at their own 22-yard line. Quarterback Daniel Lyons tried to throw a screen pass to his wide receiver but the Laker pass rush disrupted his throw, which sailed by the receiver into Herbst’s hands. After a bad exchange on the first Prior Lake snap caused them to lose a yard, running back/linebacker Spencer Shaver took a handoff, bounced off a couple defenders at the line of scrimmage and galloped into the end zone for a 12-yard touchdown. Kicker and Mr. Soccer finalist Daniel Wee added the extra point to make it 7-0 Lakers just over a minute into the game. The Laker defense then forced a three-and-out on the next possession followed by a 4-yard punt to set Prior Lake up at the opponent’s 24-yard line. Two plays later, running back Preston Jelen took the handoff to his right, around the outside, not stopping until he was tackled into the pylon for another Laker touchdown. Wee’s extra point made the score 14-0 Lakers less than three minutes in. “Any time you can start fast, especially with how our defense is playing, it helps a lot,” Prior Lake coach Matt Gegenheimer said. Neither team could seem to do much on offense for the majority of the first half, with one promising Prior Lake drive stalling in Bear territory after a pair of costly penalties. The Lakers had an opportunity, though, in the second quarter after Herbst got his second interception of the game, this time thanks to a hit by linebacker Noah Benson, who knocked the ball out of the running back’s hands on a screen pass. However, the drive stalled when Prior Lake could not convert on a fourth down pass play. The score stayed 14-0 at halftime with Benson adding a fumble recovery to his stat sheet on a sack as time expired. The Bears looked as if they might threaten late in the third quarter, using a long pass play to get into Laker territory but, facing a third-and-long from the 45-yard line, Lyons rolled to his right and threw the ball. Unfortunately for him, the pass was intercepted by cornerback Jaden Dorn, who was sure to tap his feet down before falling out of bounds. Dorn’s interception seemed to be just the spark the Lakers needed as the offense responded by going on a 12-play 87-yard drive into the fourth quarter, capped by a 2-yard touchdown run that made it 20-0. Wee’s extra point was blocked. Prior Lake’s defense helped out again on the following possession. Facing a fourth-and-8 from their own 43-yard line the Bears opted to go for it but Lyons was sacked by Herbst, giving the Laker offense possession at the White Bear Lake 30-yard line. Four plays later, running back Jordan Johnson broke through the Bears defense for an 18-yard touchdown to put the game out of reach. It was 27-0, which ended up as the final score, after Wee’s extra point with 6:28 left in the game. The Lakers were led statistically by Shaver, Jelen and Johnson. Shaver had 131 yards on 21 carries while Jelen had 96 yards on 13 carries and Johnson had 92 yards on 11 carries. Linebacker Zach Wick led the Laker defense with 15 tackles while Herbst had eight and lineman Zach Whaley had seven. Last Friday’s win over White Bear Lake means the Lakers are one win away from the state tournament, a game Prior Lake has played in every year since 2011, the first year the Lakers ever qualified for the state tournament. The Lakers were victorious and advanced to state in 2011 against Eastview, 2012 against Woodbury and 2014 against Eagan; games that were all played at Dan Patch Stadium. The three Prior Lake losses in that span were all road games: 2013 at Osseo, 2015 at East Ridge and 2016 at Blaine. Despite making it to this round in prior years, Gegenheimer feels that making it to this point is important considering the adversity the team had to overcome early in the year that it didn’t have in prior seasons with the three consecutive losses. 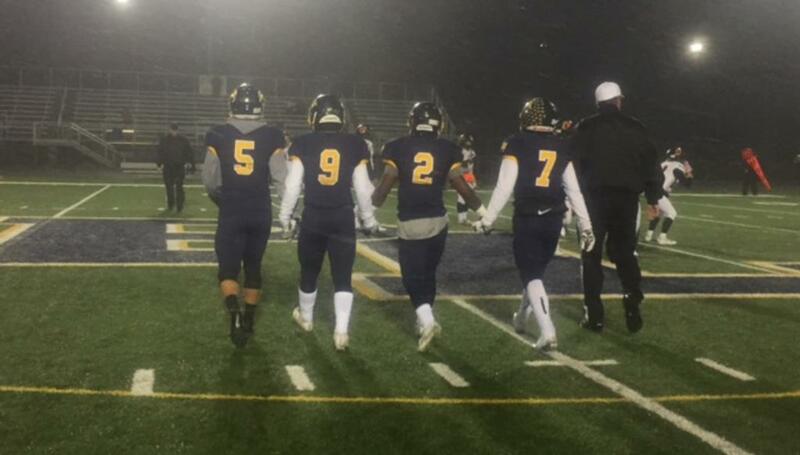 Prior Lake will look for a little revenge when they host Blaine Nov. 3 at Dan Patch Stadium in the state qualifier game, previously known as the section final. The Lakers and the Bengals met just last season in the same round, a game in which Blaine won 21-17 to end Prior Lake’s season. Gegenheimer is pleased that the Lakers will be on their home turf this year as opposed to at Blaine High School, where the teams met last year. Blaine has many returning players from that team including standout running back Byron Bynum Jr. who had 13 catches for 165 yards and two touchdowns while playing wide receiver a year ago. Bynum has moved to running back this season and has carried the team offensively, rushing for 806 yards on 166 carries and 12 touchdowns during the regular season. He added 119 yards on 16 carries and three touchdowns in last week’s win over Robbinsdale Armstrong. Also back on offense for Blaine is quarterback Connor Melton, who was 22 of 30 for 243 yards and three touchdowns when the teams met last year. This season, Melton has been just as good, completing 109 of 174 passes during the regular season with only four interceptions and was 11 for 13 with three touchdowns against Robbinsdale Armstrong. The Bengals (6-3) beat Robbinsdale Armstrong 59-21 in the snow a week ago to advance to face the Lakers. Blaine has high-profile wins over #1 seed Cretin-Derham Hall 34-21 and defending state champion Totino-Grace 28-16 as well as a one-point overtime loss to #2 seed Centennial. The other wins include Anoka 48-10, Champlin Park 46-28 and Stillwater 53-28. Their other two losses were to #1 seed St. Michael-Albertville 40-20 and to Class 5A opponent Osseo 14-7. The Winner of Friday’s game will play the winner of Rosemount-Minnetonka next Friday Nov. 10 at Osseo High School in the Class 6A State Quarterfinals. Kickoff against Blaine on Friday is scheduled for 7 p.m. at Dan Patch Stadium. Be sure to check back next week for a recap of the Blaine game and (if the Lakers win) a preview of the state quarterfinal matchup.